By	Chris Celnar. Last edited by Marios Alexandrou on October 25, 2018. We believe that people should make an informed decision before taking on the responsibility of caring for a chinchilla. Here are reasons to NOT get a chinchilla as a pet. Chinchillas are crepuscular which means they may not be awake when you are and they may make noise while you are trying to sleep. Chinchillas need attention, but they don't like to be picked up. This makes them less than ideal for young children. Chinchillas need to have their cage cleaned frequently for their own health and to keep it from smelling. 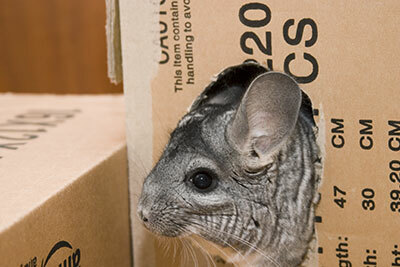 Chinchillas will chew on everything including baseboards, doors, furniture, and wires. If you can't chinchilla-proof a room, you're going to be in for a lot of maintenance. Chinchillas can live up to 20 years which means a long-term commitment. You can't leave your chinchillas unattended for days while you travel. Chinchillas don't travel well. Their skittish nature means that travel will cause them stress. Chinchillas can overheat and die under conditions that you would find tolerable. And in case you think we're anti-chinchilla (not true), check out our list of reasons to own a pet chinchilla. I have one chinchilla for almost one month now, its very exhausting the first two weeks figuring out how to chin prof a room and putting the cage together but once you make it into a routine, its easy. The esiest way to put back your chinchilla in the cage is with a pet transporter, whenever you want it back in the cage just put the transporter near and the chin will explore inside (put some hay in there) then you take the transporter and open it in the cage. Make sure you hide the transporter so the chin cant associate it with the end of fun time. We just got a chinchillas. We are a three person family (one child) and we live in a one-bedroom New York apartment. We are so excited. We got two. A mother and daughter. Unfortunately, the mother seems scared out of her wits. We also purchased a large chinchilla cage. On their third night with us, my wife was out , I thought I would bond with the chinchillas. I let them out of their cage. They are not going back in for love or money. How do you get the chinchillas to go back in the cage? After hours of coaxing we finally gave up and went to sleep. I told my wife not to leave the cage open because the little chinchilla would get free. We left the cage open anyway. Very emotional night for our family. We love the chinchillas and want to do what's best for them. My wife has a plan to create a play area for them up and down our apartmetn aisles. We have bought a fence and everything. I'm afraid we have the wrong understanding of chinchillas. I think they have no intention of ever going back into a cage. They seem to me like curious animals who don't want walls, not unlike humans. What's the best way to coax them back into their cage? One thing I did was to never physically remove them from their cage. This, I believe, resulted in their cage being the safe place they could run to. I would then coax them out of their cage by sitting still in the room or by using half of a raisin on my finger. Whenever they were spooked, they would naturally run back to their safe place i.e. their cage. Eventually I could get them to return to their cage by standing up and clapping once. As far as I could tell they're actually fine with walls and tight places. In fact, cardboard tubes and boxes were favorite places for them. Boxes placed around the room with holes cut in them at floor level might be one way you could catch them to return them to their cage. I've been looking into chinchillas for awhile now and I am really not sure if I should get one. I work 4 days a week from 5pm to 330am. I'm also a full time college student although most of my classes are online. I also live on my own with my boyfriend. I have been looking into chinchillas and the like because my boyfriend is allergic to pet dander. I don't have much experience with pets other than cats. Do you think I would be a good candidate for a chinchilla? I don't want to get an animal that I can't properly take care of and make happy. I also wanted to know if it would be better to get them as a baby and would it be better if I had two? You may think it's hard with all the stuff you read about taking care of one but it's really not a lot or that hard I have 2 and my female just had her second set of babies they are really good animals. I really thinking about a Chinchilla but my parents are deforced and in the summers I see week week school I stay with my mom and see my dad on certain weekends could I travel back and forth or should I keep at home at my moms. I also sleep with a fan and I'm keeping the Chin in my room ,the fan points at my face, it is not loud ,is it bad??? I happen to own 7 chinchillas and my chin Squeakers never makes noise when I sleep. This article is false and weird. Do not listen to it. They are active at night so no it wouldn't be loud. They make ALOT of noise. I have a chinchilla and he is soooo cute. But his pee smells really bad. So I have to clean him very often. He jumps out of my hands sometimes because he loves to run, it is so hard, yes, to get him back in his cage. They love to take dust baths, so you can put out the dust bath, and they will go towards it. They will get scared if you chase it, so you can always coax him to you with cheerios, mine lovesss them. I hope I helped you all. Chins aren't good with travel and with schedules that aren't constant. They can get stressed easily and will make bonding pretty difficult. I would recommend a pet like a rat or guinea pig. Hi. I'm in college as well. I will be living in an apartment with two other girls who are fine with having one. I will be gone most of the day either working or at classes and home at night studying. I usually stay up pretty late. I will be living up there and coming home on breaks. Spring break and winter break. Would having a chin be too hard with finding someone to take care of it if I'm gone on a short vacation or study abroad trip? Thanks. I just really want a pet while I'm at college and these guys just interest me a lot. I'm studying to be a veterinarian. I'm thinking while you study let out your chin. And maybe have your roommates take care of the chin while your gone. Hi I'm a college student and was hoping to keep a chinchilla in my bedroom and then in a room right off my bedroom at night. Realistically, how noisy are they at night? I need to know if it's going to keep me awake at night before I get one. Also, I'm usually relatively quiet during the day but would definitely be in the room while my chinchilla is sleeping. Would this be an issue? Most of the time it depends on your chin's personality and what kinda of toys and interactive things it has in it's cage. For example, my chin has a wheel, a bell toy, and toilet paper rolls to chew on. His personality makes him pretty quiet, but when he's playing I can hear him (his cage is less than 5 feet away from my bed) however, it's not enough to prevent me from going to sleep and he doesn't wake me up. Also, if you're a light sleeper, you'll probably be disturbed more. They're not especially loud (they don't vocalize much) but when they're active you'll hear them moving around. I always make sure that I exercise my chinchilla a couple of hours before I go to bed so he's not nearly as active while I'm asleep. I have two chinchillas that have been a breeding pair for 6 years. I got them about a year ago from a pet shop as they were no longer breeding. The female is very easy to look after the male on the other hand is diabetic and has an ear deformity and dry skin on his ears and feet. looking after him is very difficult as he has a special diet and they live in the same cage. The cage is about 1ft away from my bed and i leave the tv on dim over night, they seem to be quieter when i have it on. and they like to sit and watch it. When i first got them they travelled for an hour to my house where they were quick shaky and scared but after leaving them for several hours they seemed really friendly. I love my chinnys and anyone who is thinking of getting one i would 100000% recommend it. The best pets ive had. I will have the air conditioning on, but I'm worried how stressed she will be. But I don't know what my plans are. Please help me. Wow you are so so lucky to have all those fur babies! What's it like? I know how you feel. my boyfriend wants a snake for a bet and I want what you are getting. but he told me no. I think they are cute. I hate snakes. Dump your boyfriend & get the Chinchilla! The fact that he tells you “no” & he gets the snake that he wants (& doesn’t care about the fact you hate them!) makes HIM the snake in my opinion!!! I've worked at the valley view chinchilla ranch in vista california for years, they have been providing quality care and animals for over 30 years. Chinchillas make great pets, they are loving, like to snuggle, and are easy to care for. The only downside to owning a chinchilla is they can't take temperatures over 80 degrees Fahrenheit. Each chinchilla has their own personality and they live a long time, they can live up to 20 years. Personally I own 5 chinchillas and they are one of the best pets I've ever owned. What's great about chinchillas is they are hypoallergenic, they don't get fleas or pests like other animals beause they have more than 100 hairs per follicle, they rarely get sick as long as you feed them properly. Chinchillas are nocturnal animals so it's best to keep them In a room where you don't sleep, although I've gotten used to their noise, and definitely don't keep them in the garage! They can make a little bit of a mess so put a towel under the cage. I also recommend to not buy foods from major pet stores they are labeled chinchilla food but I've seen pet store food cause chinchillas to get very sick and die as a result. Make sure to do your research on what to feed them, our website has great information and you can always call if you have any questions! You shouldn't get one if you know you're going away to college. They are really bad at adapting and can connect with maximum one or two people. I would suggest an animal that is more flexible and loungy like a rat. I relate. I am in highschool too, and I barely have no time for my chinchilla. It is so sad, but on weekends I play with him all the time. Do you have a cooling stone for your chinchilla? I would get that, it is on amazon. Buy two, and keep one in the freezer and the other cold one with your chinchilla. Swap them if they get warm. Kat is right. They love to be held a snuggled depending on if they trust you yet or not. Make sure you make them feel special and lo... Sorry. Wrong button. I meant loved. Get one and dont squeeze it too much or hold it by its tail it will rip it off. Thanks Rachel, and another thing. How can I persuade my parents to get me one? We are already thinking about it and I might, but how do I make sure? Btw, this is to all of the people saying bad things about chinchillas. Chinchillas are like squirrels. They are playful, fun, and jumpy! Get one if you have the time and money. I have one of those things... Time. No money:( But Thanks anyways!!! They are just like squirrels! And it makes them so much fun. Once they gain the trust for you, their personality comes out and they are so much fun. As for talking your parents into it, that is always tough haha, it took me quite a while. But I started out by doing a lot of research online about them and finding videos of them and I'd show them to my parents, and they would be like "yea...its cute...". Up until I got the chinchilla, they were very iffy about it, they weren't sure how they'd like it. But you can tell your parents this if you want: My parents have fallen in love with my chinchilla. They really didn't think they'd like him that much, but they didn't think he would have that much of a personality. This little guy has more personality than my cats! Hahaha. My mom tells me constantly that she didn't think he would be this cute or lovable, and now she is scratching his head every morning before she leaves for work. They are a bit of work to have, but I find it completely worth it. Chinchillas require alot of time and money. They need a lot of different chew toys and new cage accesories to keep them happy. They are super smart but because of this can get depressed and bored very easily if you don't have experience with taking care of a small animal. They are a lot of work and require a lot of cleaning. They do not require that many toys, though. You could re introduce them often to them. Hi, i am seriously thinking about getting a chinchilla :) but i would really like to know if you can mix chinchillas with other small animals like a guinie pig in the same cage? also how much does it overall cost, meaning cage, pet, toys, ect.? And what I meant was a bad idea, is housing different rodent together. And chinchillas are FRAGILE. NOOOO do not do it. My sister´s gerbil bit me in reaction to meeting my chinchilla. They will kill each other. Sorry, I do not want to scare you! My parents won't me get a chin. I have the money i have the space, the time and im also responsible. They say oh well we dont need any more pets but my moms questioning about chinchillas so its improving. I just need help to convince my dad and little bit of my mom. also i can get help from my firnd who has had a chinchilla for 3 yrs but still no! I have had many chinchillas as well as other varied pets in my chilhood and as an adult. Each chin is a truly wonderful creature. I believe that anyone considering a chinchilla friend should NOT have a menagerie of pets already! A chinchilla or two should be your focus, concentrate your resources on being the best friend you can be to your chinchilla. Always have extra time and money and QUIET space for each chinchilla so you love each other totally. Hey, I am thinking about getting a chinchilla and since chinchilla fur is thick and I sleep in the basement (which is usually around 60 degrees , give or take) would it be good temps for a chinchilla? I think upstairs would be too warm- especially in the winter. yes thats perfect! dont let it go below 50 degrees or higher than 70.
in my room it may at some times reach 80 to 85 but i have an air purifier i have running all the time would that be good to have set on low blowing on the cage? NO do not let it blow on the cage it won't make a difference with their thick fur. You need to find a room that can be cool without having a draft blown on your chin. They make cooling rocks that make your chinchilla cooler, you can even get two and on warmer days switch them from the refrisgerator every few hours. Im getting a chinchilla soon, but I dont know the proper heating and air conditioning arrangements it should have. Im worried to death. Like what degrees should a room be? Im at school all day, but leave the air conditioning on in my room all day. Is that too cold for them? and my mom is really cold all the time. So in the winter what should I do. Since she cranks up the heat? The location of the animal's cage is important. Chinchillas thrive in moderat tempertures. Tempertures above 80'F are uncofortable for them and those above 90'F are dangerous. When selecting a place for the cage, pick an area where it will be cool or where air can be kept on the move if high tempertures occur. Don't place the cage where it will receive lots of sun all day long, and don't put your pet outside in it's cage or in an unisulated garage or attic where tempertures can soar. im sorry but this is very untrue. in fact what you just said could get that chinchilla killed. Colton chinchillas thrive in temperatures between 50-70 degrees F. once it gets above 70 they get uncomfortable, once it gets above 75-80 your chinchilla is in serious trouble. the chinchilla is most likely to get heat stroke and die. im not trying to nag at you kaitlyn but that book is most likely incorrect if it cant even get a simple fact like temperature right. Actually Emily, what you are saying is completely untrue. I keep my chinchilla in 78 degrees because that is what I keep my air conditioning at (I live in Florida year-round) and he is absolutely fine! I keep the fan in my room on so that it cools him down a bit more without it blowing in his face. Chins are not going to die when it gets to 75-80 degrees. Well at least mine isn't. I am thinking about getting a Chin. I have worked with all kinds of animals and used to have guinea pig but never a Chin. How loud can they be at night? I know they are nocturnal but didn't know how much noise they would make. Also with my guinea pig I could leave him for over the weekend with food and water if I was going out of town - can you do this with Chinchillas or do you need someone to check on them? I am no expert on Chinchillas but it used to be very loud in my room at night with my Chin. I do think it depends on your Chin's cage though. I kinda have a cheaper cage. It's big but it really rattles when she would run in her wheel. So I then decided to start taking the wheel out at night and after that I haven't had any problems sleeping. She will seldomly bark but its few and far between. They can be loud, but I think that it's unfair to take out their wheel at night. Since they are nocturnal, they are most active at night and if they don't have anything in their cage to exercise on, it's unhealthy. Just put them in a different room at night instead of taking away their main source of exercise while in their cage. i agree with cortney, its not fair to the chinchilla. have you ever thought about getting a better cage and wheel? - solid surface= prevents chinchillas feet, tails, and toes from getting caught. - no cross bars= chinchillas have been known to get their feet, tails, legs, and even heads caught in her when running and exiting the wheel. - no plastic= for obvious reasons, they can chew it and get an impaction. - 15'' or bigger diameter= wheels smaller than that and their back will suffer pernament damage from having their back bent. you would need someone to keep an eye on the pet because they might run out of food,even if you put alot in there the chinchilla might gorge its self with food, and the floor of the cage ,full of dropping, might get them sick because you have to clean the bottom of the cage out every day. chinchillas dont make that much noise it would not wake you up if you were sleeping. if you're gone for more than a night and a day you need someone coming in and checking and interacting with your chinchilla as much as possible. They can get hurt very easily especially when left alone too long with boredom. I just bought my chinchilla today and he LOVES being held. i stick my arm into the cage and he jumps right on it! He's so sweet. I guess it all depends on their personality. My house heats up in the summer, much hotter than it is outside. This may be because I hate anything much hotter than 80 degrees Fahrenheit, but if my Chinchilla gets overheated then what can I do to cool them down? A fan? Do they like to chew on ice? I don´t know if they chew ice, but keep in mind that when ice melt, they can get wet and that's bad. For my chinchilla, I'm building a refrigeration system with some old heatsinks from two old computers of mine and peltie units that I bought online. You can put some stones in the refrigerator, and them put them in your pet cage, but pay attention to water condensation. They have marble ledges that you can use so that your chinchilla won't overheat. Go to any pet store to find them especially Pet Smart and PetCo. Plus make sure their house has fresh dust at least once or twice a week, fresh water and a salt wheel. It helps. Chinchillas aren't like a dog or cat. they are like over sized hamsters, mainly they are fun to look at and are cute but bonding with them wont happen. I disagree with the statement that they hate to be held. I recently purchased a chinchilla and from the very start he loves nothing better than to be held and carried around with me. when it says that they don't like to be held.... is that true?? i was thinking about getting one, but if they don't like to be held then i don't think i really do anymore. i have never heard that before. so chinchilla owners, please let me know because this will decide it for me. i love to hold animals, and i have held a baby chinchilla before. they're soooo cute! also, how small can you get them? I dont like to be held for a long time but really are a show pet and not a bonding pet. Ihave two and I wish i had gotten a ferrit. Most don't want to be held, but if a chinchilla is properly bonded to a human they are more flexible. Chinchillas learn a lot of their adopted behavior when they're under a year so if you condition them as babies they wont care when you hold them. Those who say their chins get mad when not held are probably misinterpreting their curious nature and their need to explore and leave the cage. I got to play with a chinchilla for the first time and I loved the little guy. I really want one now, but I was wondering if it would be okay for me. I live in a semi-busy house because I have two brothers, I have a dog(problem? ), and Im really busy and am at school all day long so I probably wont really be able to play with it a lot. Also, I heard that they can become really mean if you dont treat them right and the heat thing about them makes me nervous since Im not home a lot. So um I was just really wondering what you chinchilla owners thought; am I ready for a chinchilla? i think that if you spend time with it every day you'll be a great chinchilla owner. i have never heard that they get really mean. the one thing that i would be carful about is the dog. i'm not sure how the chinchilla will respond to a dog. i wouldn't risk it. it would probably be scared, but as long as they aren't set loose together you should be okay. If you are that busy with school, etc., you probably don't need another responsibility. No one wants to be in the corner neglected!!! As long as you don't treat them mean, you shouldn't have a problem!! I have a prooobleeeeem! ! ! It's really hard on this delicate animal to travel and planes have such a pressure and noise that might cause your chin to go a little crazy. No matter how bonded you are an unhappy chin is not a fun pet. I have a lake house that I go to quite regularly. What should with my chinchilla when I leave. This all depends on the length of time that you'll be gone. You can get a weekender bottle which is large enough to sustain one chinchilla for about a week or so. As for food, a feeder that you can fill up and and slowly goes down the more they eat is a good way to keep it fed. Change it's bedding right before you leave but don't be gone for two long. Have someone check on it and give it fresh food, water, hay, and chew toys every 2 days. I'm thinking about getting a chinchilla and not certain about the temp. The room where it'd stay in the day would be quite small and has and uncovered window. I won't always be there for the daytime and was wondering if putting a sheet or towel over the cage so the sun won't directly hit it would be okay. I'm just worried about the heat and such. Please and thank you! A normal room temp like 70 degrees F is ok. Keep them out of direct airflow and sunlight as much as possible. I wouldn't put anything on top of the cage like a towel or a sheet because they'll just chew it up. I would tack a sheet onto the window if at all possible. They are curious and explore, putting a sheet over the chinchilla will cause it to be bored and possibly depressed. THis can lead to sickness and death, I would be very careful w this decision and would suggest getting a pet that is loungy and doesnt care like a rat. can my chinchilla cage be under an air vent? They will be ok as long as you keep it relatively cool in the car. Not a straight line of air toward them, but an overall cold to keep their tension down. Also, no loud noises like music. Talking to them can help as well. When I moved about 30 minutes away from where I had them, I would just talk to them a little and they liked it for all I knew because they weren't barking at me. like at like 68 degrees is that cool enough? I read online that between 19-24 degrees celsius is good. You really should be more aware of how warm it is because a chinchilla can get heat stroke very easily. You don't have to worry too much about how cold it is because a chinchilla's natural habitat is in a desert -that's why they take dirt baths- which becomes VERY cold at night. We've traveled hundreds of miles with chinchillas with no problem. Just be sure their cage is not in direct sunlight to eliminate possible overheating and keep the ambient temp in your car in the 68-70 degree range and they will be fine. Aloha, my chinchilla travels with me in the train once a month (8hr travel), she is very curious, and is always peeking trough the bars of her small traveling cage. I keep her near me during the entire travel. In the stations she becomes very active and is always smelling the air for all the odors. The 1st thing I do when arrive home is let her go free, and bath in her dust tub, that way she relax a bit. And after a while I pick her up and put her in her larger (3 floors) cage. Chinchillas are so cute but why are they called chinchillas? is there any way to help prevent chinchillas from chewing of doors,furniture,wires and all of that other stuff? Yeah, they are a bit of the hassle, just to add on the heating thing, I didn't realise it's summer and well it's much much much much warmer and I took my chinchin with me to work like I always do, and then to my bf's place so he can play with the other chinchin. Now.. if your chinchilla gets limp and slow and is rubbing itse'f on the ground, or from the first sign which is red ears, just do it a favour and put cold water on it's ears and nose and leave it on the ground because it will faint. Which I didn't know. Sooo it fainted. And after reaserching the interwebs I came across the idea of putting him in a bowl of water. Don't worry about getting them wet because as I found out their fur is so thick water (after 10 mins of being in it) didn't yet reach the roots of it's fur. So imagine how hot they get, too. So yeah just a heads up on what to do if they overheat, since it may happen it's something every owner should know and try to keep it from happening as much as they can. Otto was fine in an hour. Just really wet and looking like an anorexic rat - cute, eh? where is curious critters located? always buy from a reputable dealer, someone who handles them with care and raised the baby with its family. If not when you get the chinchilla theyre already conditioned to a scary, uncomfortable life and will never see you as a play mate. Just a little advice to those who want to buy any chinchilla from a pet store, theyre especially easy to be scarred permanently from a lifestyle of bright lights and fighting with unrelated chinchillas stuffed into small cages. My chinchillas sleep in spots, not all day, awake all night just random times. If you can go to a friendsd house who has a chinchilla or go to a pet store first before getting one. And DO A TON OF RESEARCH! Hello, my mom is considering getting me a chinchilla in about a year or so. I have done so mych research and am dying to get one. I just wanted to know if they are good pets, how ofen you need to clean there cages, and such. I have looked online but I want an anwser from someone experienced with chinchillas. I have four chinchillas and I will say that they are definately a long term commitment. I'm sure you've read that they can live up to 20 years so you have to be COMPLETELY sure about buying one. They are loveable and very socialable. As far as cost, they can cost a pretty penny as far as keeping them sheltered in a proper cage and maintaining them in a healthy state of being. Although they are very laid back when chillin out in their cage, they need "outside time". They need a room or an enclosure where they can roam freely get out all of their chinchilla curiosity. This is a very vital part of being a chinchilla owner because if they are not allowed time and space to get out and burn off that excess energy, personality disorders can occur from being terrified to come out of their cage to if they do get out via escape, they feel like they have to run away just to get that time to run around free. And if they do get out, chasing them is the last thing you should do for it will degrade whatever trust the chinchilla had with you. Close off any access to other rooms but coax him by a treat or a dust bath. They usually cannot resist either. If you get close enough, be careful about grabbing for him because if they feel threatened, they will take off running and throw fur at you as a defense mechanism. So bottom line: they need enough room to roam in and out of their cage. A cage with shelves for jumping is ideal for they have energy to burn. A wire cage is fine but one with a solid floor is considerably better. You clean their cage(s) constantly as far as sweeping/vacuuming up their droppings for there will be many and roughly twice a month for a deep cleaning such as empty out all the bedding, wipe down the platforms to get rid of stuck on debris, wash and disinfect food dishes and water bottles. A single chinchilla is easier and cheaper to mantain then multiples for chinchilla food and bedding can get expensive and I have yet to find a chinchilla food that comes in bulk and their bedding doesn't come in big enough bags I think. Their bedding is not just your ordinary pine bedding like we used with hamsters. The best kind of bedding you could possible get is Carefresh Compressed Bedding. It looks like chunks of paper almost. It's the most absorbent, absorbs odors, is non-toxic, lasts the longest and it's 100% safe. As far as treats, my chinchillas LOVE papaya bits that you can buy in a pet store BUT these are only to be given in small quantities and only on occasion. They are very healthy for them but chinchillas have delicate digestive systems and you should moniter what they eat and in what quantity. Now as far as handling a chinchilla, it takes time and a serious commitment for a chinchilla and its owner to become aquainted and eventually form a bond of trust. As far as handling them is concerned, the grease from your hands can severely damage their coat over time so a dust bath (volcanic dust can be bought at pet supply stores) three times weekly if not more is nessecary since water baths are generally a last resort for problem cases. Besides, they love to jump in and twirl and spin around. They have real thick fur coats so keeping them cool in the summer is a definate MUST. If it's 80 degrees outside and you don't want to have the air on anymore so you open up some windows to get that breeze going, think again! Unless you installed an air conditioner specifically for your chinchilla, that is a dangerous move. For every hair follicle in their skin, there are 50 hairs as opposed to our one hair per follicle. So you can imagine that keeping these critters cool is a priority! You can buy a marble square slab from a pet store made for chinchillas. You put them in the freezer for 30 minutes or so and they come out real cold. They love to rub their faces on it and sit on it to cool down. Chinchillas are part of the rodentia family; meaning their teeth grow constantly. You need animal safe objects like wood, undyed and untreated twigs and sticks, even parrot toys that hang do great(I stear clear of any that have plastic or rope; i either don't buy it or cut the rope off if there is just rope). They love to be preoccupied with anything while their in there cage. A wheel is a must too. I use a wire wheel because it's the biggest I have found(roughly 13''). But it is a squared off wire wheel so they can't get their fingers and toes caught and broken. I have practically gone over everything I can think of in a nutshell. Any other questions let me know. Chinchillas may not like to be held, but certainly you can hold them. They just aren't cuddly like cats or dogs. You can pet them and hold them but not for hours on end. I had a chinchilla and after about 3 or 4 mintues they were like "OK enough of this," and they want to do their own thing. Once they're used to you they will see you as friendly and will come over and investigate you and play. But they are NOT like dogs and cats. They only come to you when THEY feel like it. A cat or dog crawls on you because they want your love and attention. A chinchilla crawls over you because you're just another high place. There is a small organization in the SF Bay Area that finds homes for chinchillas. Not looking for chinchillas, but want info? You can find that on their website, too. Recently my mother has been thinking about me getting a chinchilla. I've done alot of research and the only thing that concerns me is how they are easily scared. The chinchilla would be staying in my room which is right above our garage. The problem is that when the garage door opens and closes it kind of shakes my room and makes a noise. I was wondering if this would be ok for the chinchilla after it gets used to it or if it is something to be concerned about. I want to get a Chinchilla but I have researched they do not like to be handled. Is this true? Because one of the reasons why I would want one, is so I could hold it. They are also nocturnal. Rabbits are nocturnal too, but I also see them running around which is good, because I would want to play with it during the day. It sounds like you're doing everything just fine. It's unlikely that your chinchilla is truly staring outside in some longing way. They sometimes go in these trance-like states and it's nothing to worry about. Chinchillas don't always get along with each other so getting another may not be an improvement at all. Having said that, if you have the time and patience to introduce a second chinchilla, go for it. Your best bet is to find a breeder that will allow you to return the chinchilla if need be. I own a 7-month-old male chin. I've had him since June, and he's my one and only. That said, I'm his only company. Everytime I let him out of his cage to play, he seems to do his own thing and appears fine. However, I've noted (especially of late) that he usually sits in his cage (wide awake) and stares outside. I almost get the impression that he may be lonely. How can I tell if my chinchilla is in need of a companion? I give him as much attention as I can considering that I have a full-time job and work 10 hours a day plus go out often. Any advice would be greatly appreciated. Thanks. An AC is fine around chinchillas. We use one to keep a room at a constant temperature in the summer. Alberta weather is also dry (at least in Calgary it is) which is a good thing. Do you know of anyone who has a chinchilla in a classroom setting. I teach high school biology and I am looking for another pet.We had a hedgehog but he recently pass away. Thank you. This is a terrible idea. They are good with one person in a quiet area. They sleep during the day especially the time school is in session. Get a rat or a guinea pigs, chinchilla would be too much work for little reward in this setting. I live in Alberta Canada where nine months out of ten are cold but the summer months ten to be quite warm. I have a portable air conditioner that could be used to keep the room the chinchilla is in at a reasonable temp. but is it harmful to have an air conditioner used around the chinchilla on a regular basis during the summer? Hey Christen! I was wondering, being in college and having friends and roommates- did your chinchilla mind the noise? My boyfriend and I are researching before we consider purchasing and caring for such an awesome animal! We're both musicians, however. I'm concerned that my occasional banging on the washboard and his infernal fiddling may be too much stimulation. Any info regarding noise sensitivity, if you have it, would be greatly appreciated. 68 degrees is fine. Don't worry about it being too cold at that temperature. Remember, these friends of ours are furry and made for cold weather. I keep my apartment pretty cold, thermostat around 68 most of the time. Is that too cold for a Chin? I know to keep the little guys away from drafts (so, not in front of an air vent, or on the floor near it), but again, I worry that my place might be a little chilly. We don't think chinchillas make good pets for younger children. They are often skittish and aren't the ideal pet for constantly being held and played with. My son is almost 8 and totally in love with the thought of owning a chinchilla though he has never had one or has any friends who have one. Are they good pets for younger children? It seems they dont like to be held for too long and there most active when he most likely would be asleep. I'd advise to not get a chinchilla, mainly because they don't like to be held [and by held i mean cuddled]. A really great substitute in my opinion is a rabbit. Its a great pet for young children who want to start learning about responsibility and care for animals. Plus, Rabbits are wonderful for just holding and petting. Well, my sister has 2 cats and a dog which i don't even think i interact with but will i be able to go to school during early morning and early afternoon and come home and play with my chinchilla? A chinchilla probably isn't the best pet for a college-bound individual. Your schedule in college will likely be hectic both from an educational and social perspective. In addition, should you find yourself with roommates which isn't too uncommon, having a chinchilla may not be a good idea. We think you should wait until after you graduate. It sounds like you have plenty of pets to care for already! I've got a question. I am 15 and wanting to get a chin. I have the time, money, and everything like that. But my parents don't think its a good idea to get one because when I go to college, the chinchilla will have to go to college with me and I wont be able to handle it. Do you think that will be an issue later on, or would I be able to take it with me without a problem? They can bite, but they are unlikely to do so. Their first choice when scared is to run away and hide. However, if your fingers, for example, smell of raisins they'll take a nibble. Even in such situations our chinchillas have never broken the skin. I would keep cats away from chinchillas. Cats are predators by nature and will likely harm a chinchilla. Would a chinchilla be scared and terrified of cats and do you know if the cats would hurt it? What kinds of foods could I get it? We do two things. Home Depot carries this plastic stuff that we cover the baseboards with. We believe they are originally designed to cover eavestroughs, it's white, has holes in it like a fence, and is about 8 inches tall and 3 feet wide. We think it is intended to keep eavestroughs clear from leaves and other material. We also use pine molding to protect doors and other areas as needed. I have a quick question... any ideas on how to "chinchilla proof" a room? My chinchillas have found a way to destroy everything I put up to try and hide the moulding and such... I would appreciate any help on this topic as they are slowly destroying my bedroom at the moment...haha :) it's a good thing they are so cute!!. A breeder is unlikely to take your 5 year-old chinchilla. Most breeders don't need extra chinchillas and many are very particular about a chinchilla's history. You would need to find an alternate person to take your chinchilla. One thing you might want to consider is finding a chinchilla rescue local to you and taking one of their older chins. I am currently in college and live in a pretty quiet apartment building, have time at night to take care of one, and have the money to afford one. I am planning on getting married in the next year or so and having children a few years after that. My question is if at any time I need to give away my Chin (God forbid) will breeders usually take a 5 year old for free for breeding? Or would I have to find some sort of shelter? The PetSmart near me only sells male chinchillas and I want to know if a male chinchilla will pee on me or my friends and if the cage will smell more. Your personality is certainly a factor in determining whether a chinchilla is right for you or not, but equally important is determining whether you can provide the necessary time and a proper environment. I was wondering if a chinchilla would be a good pet for me. I am very calm and responsible and I hate traveling. Would it be a good pet for me? I'd guess that a college dorm room wouldn't be ideal for a chinchilla. They sleep during the day and are awake at night. You and your friends will likely keep a chinchilla awake during the day while the chinchilla will keep you awake during the night. We keep ours in another room with two doors in between us. They still manage to wake us up sometimes when a stick or food dish is knocked off of a shelf. I'd say wait another year. At least then you'll know where you'll be once you graduate. I have the opposite question as "Birthday girl"...I'm currently in college, living on campus for one more year. Do you think the college environment is too stressful for a chin? A friend's just had six, and, while I want one, I want what's best for it.